Since 2005 Direct INFO has quarterly issued the Report on Fixed Communications, Data Communication and Internet in Moscow. The Report is issued in the month second after the accounting period end for quarterly reports and on the month fifth after the accounting period end for yearly reports. This research results are employed by such key Moscow telecoms operators as Komstar OTS, Sinterra, Tsentralniy Telegraf, Rostelekom and some consulting companies. The Report consists of two parts. The first one contains analysis of Moscow macroeconomic development progress in the period under review and of activities able to significantly influence telecoms market of the city. Also there are given economic development forecsats for Moscow for the near five years, financial performance progress of Moscow telecoms companies, data on market distribution among holding companies and holding shares across customer segments (operator, private and corporate segments). In addition, there is presented an analysis of numerous activities defining the telecoms market development level in Moscow: number capacity distribution, distribution of PC, broadband Internet access and pay-TV, etc. This report also contains data on proceeds structure of telecoms services rendering, available technology (telephone sets, modem equipment, broadband Internet access equipment, etc. ), exchange in electric communication networks (mobile, local and long-distance communications traffic; data transfer and Internet traffic, etc.) divided according to operators (new and traditional) and customers (individuals and organizations). The second part of the report – special reviews devoted to research results received by Direct INFO. These results are based on consumer surveys held in different segments of Moscow telecoms market. 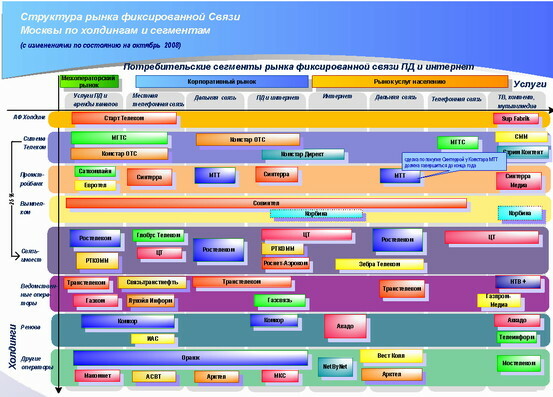 The researches mentioned above were carried out at different times and concerned analyzing of long-distance communication market for organizations and individuals, demand for Triple-Play and its market potential in the capital, using wireless Internet access services, telecoms and ICT services at Moscow companies, and individual consumers’ preferences related to using PC and Internet services. To specify the content of this part of the report in the period you are interested in contact our consultants.